Several days ago on a muddy trek through the state park, the dials in my brain spun ever so slightly and I had an epiphany. It was an epiphany that I’ve had before which, to some, might disqualify it as an epiphany but for me the important stuff seems to occur repeatedly, a new layer falls off, and I see a bit more each time. Clarity is movement to a core, a simplicity emerging from what used to seem complex. So, I had a repeating epiphany. Last year I attended The Chicago Art Expo. To my shock and surprise, rather than being challenged and energized, I ran screaming from the building. It was disconcerting. It was disorienting. Rather than having direct experiences with art that opened my eyes or challenged my world, I had experiences with curators who were compelled to tell me why the work had merit. They felt the need to locate the meaning and value for me. There was, in each booth, an art-high- priest standing between me and the experience. In fairness, I often felt that, without the interpreter, there was no experience to be had. It was a mental exercise. In the grand scheme of things, Art serves a purpose. It carries the common story, the cultural identity. It is necessary, not luxury. In that sense, for it to serve its purpose, it requires no interpreter. When it no longer serves its intrinsic purpose – or there no longer exists a common center – an interpreter (marketer) is inevitable. Joseph Campbell wrote a book called The Inner Reaches of Outer Space. Art (theatre, visual, dance, music), for me, has deep value when it serves the outer reaches of inner space. It is immediately accessible, touching a universal nerve. It has to reach. Standing in the mud and muck of the park, we took a break by the shore of a lake and listened. The wind moved the trees, the limbs clacked and groaned. Crows chased an owl. The sun warmed my face. A layer fell off and a core came closer to focus. This is not a diatribe against abstraction. We recently saw a Sam Francis exhibit at The Milwaukee Art Museum that left me in tears. 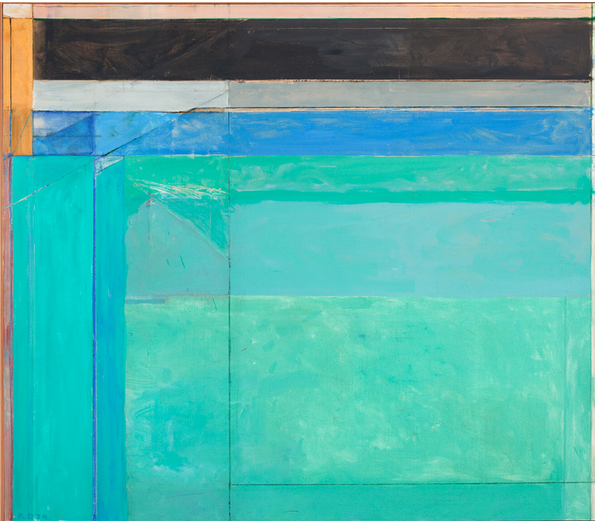 I’ve spent hours in front of a Diebenkorn, one of his Ocean Park series, and I can’t get enough of it. I visit it often, like a pilgrim on a pilgrimage. It moves something deep within me. It speaks to something bigger than me and makes me want to be better and better. Standing before it I feel a part of a conversation of hearts and imaginations and deep space calls. I feel a part of a bigger story.